After greeting you so friendly at the door to be shocked by the total number of guests that would be in your party. Twenty… Let me repeat that TWENTY. I along with a fellow server we took time away from our other tables to set up a “table” for twenty, that being said I situated myself and got ready for an organized order with laughs and polite conversing. Little did I know you have now changed your guest count to an eight top. That’s fine, wonderful in fact I can focus more on each person their order, refills and my other tables… HA-HA you tricked me! 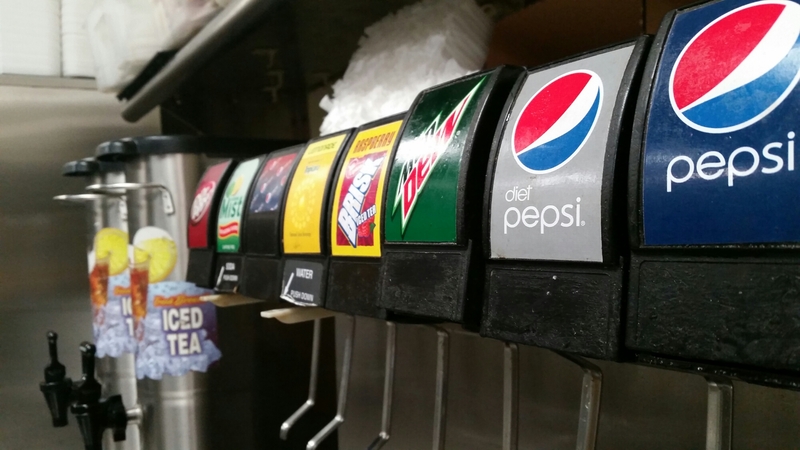 After being ordered back and forth for more ranch, refills, dislikes of Bahama Mamas and Long Island Ice-tea I asked a young girl what was wrong… If there was anything I could get her, when she went on to tell me about being stressed and her children. 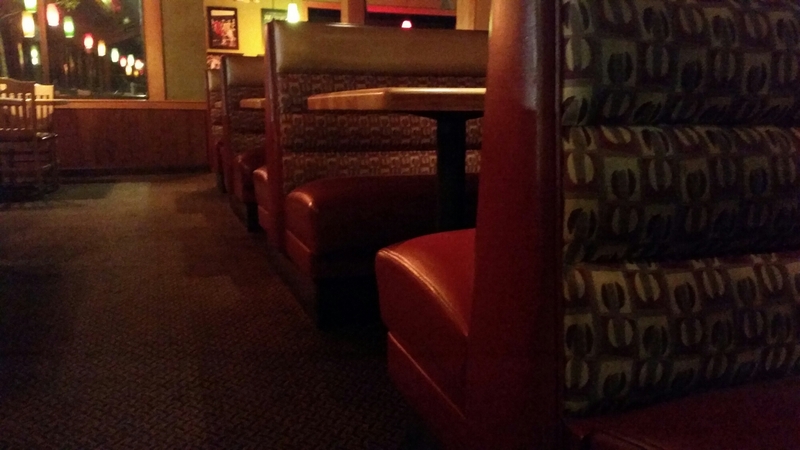 After which I began to talk about mine, I took time from my other table in which was waiting for only a to go item to finish and to pay their check. You asked to see photos and said how adorable they are, I ignored your guy friends while they kept asking for my number, my age and my name. Well hello my name tag is on my shirt… But thank you for not noticing or hearing when I greeted the table saying “Welcome to… My names Melissa I’ll be your server tonight can I start you with a Corona, Long Island Ice tea or maybe a lemonade? When it came time to pay you acted like I was a complete moron and couldn’t count how many beers your party had… You tried to rip me off more then once even after I took off two drinks because you disliked them… When checks were separated and each person began to pay I brought back change for some, I ran for to-go boxes and I laughed with you. I told you to have a wonderful, careful night as you left the bills on the table with money. I’d like to thank you for my .31 cent tip… After seeing that I have children, after saying you know what it’s like to be a waitress… But maybe just maybe you need it more then I do; though at times like these I think everyone needs a little help. Maybe one day you’ll know what it’s like to run back and forth, smile even after hearing another waitress tell you that your table was calling you names and laughing at you. Maybe you’ll know what it’s like to have a bad tip from not only that one table that messed with you but another table thinking you forgot about them because your attention then was split but unfairly 25%-75% when your snapping your fingers, waving your arms and making a scene so I rush to your aid. To everyone that visits a restaurant I want you to know how one table can ruin your day; how we live tip to tip not pay check to pay check or make so much that we don’t have to worry. At the end of the week or biweekly we aren’t looking for our paychecks because we already know how they look. We are taxed so harshly that we end up with no paycheck or enough to order a couple things off the dollar menu. We aren’t all college students just there for a moment to get some play cash, we’re parents and adults on our with our own bills and needs never mind our wants. All I’m really saying is when a server approaches you don’t begin to judge them like oh they have four tables our $67.81 meal we only need to leave a couple dollars. 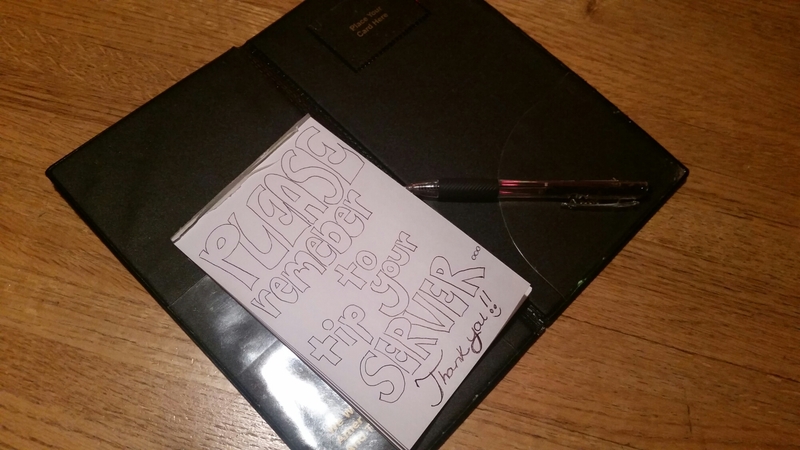 Tip appropriately please. There’s moms like me missing the first moments with their children; missing first words, first wave or maybe their oldest child’s first soccer game or school event. While you are enjoying your meal and see us smiling, playing and so attentive to the children you are with maybe it’s because we are missing our own; unable to make them dinner, help them color and laugh. Our hours are unsteady, we wash silverware and roll, dishes, restock and refill drinks, napkins and prep foods that you all are ordering. We’re sweeping, mopping and keeping a smile as hard as we can; but you have that make it or break it option. With the attitude you give us, sometimes we make mistakes whether in the kitchen or front we are all human. There’s just no way of being perfect 24/7; we’re thinking about table 34 and what they just asked me to get or how I’ve ran back and forth six times already for the same things because instead of everyone speaking at once that they’d all like ranch or honey mustard they have me doing laps. Thank you table 76 for being so kind. We’re all just trying to make a living, though this isn’t what most of us thought our future would be is just getting by or stressing over bills and holidays. If we all took the time to care about one another a bit more, understand maybe the waitress is on a double and is hungry also. We don’t get regular breaks like you might at any other job. But not just waitresses having tough times, the cooks and the dishwasher from the employees that instead of saying ok it’s a mistake find someone to blame. From the plate not having enough fries or the spoons being out when you need it for a soup… Help one another out, remember no one’s perfect that’s why its called teamwork. 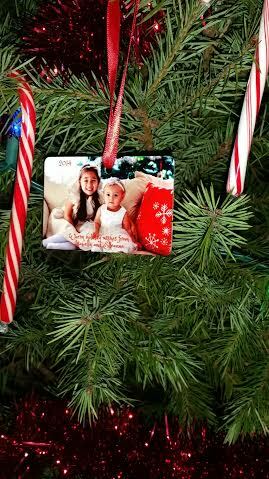 The lighting setting perfectly in the background, a tree decorated and shinning lights as the glow of my princesses smiles light up our Christmas photo. What better way to add a touch of love to presents for family near and far then this wonderful wrapping paper? I never imagined how amazing it could be to wrap grandparents gifts with the smile of my girls. The clarity and special text that I personally added was as if I had picked up a limited edition wrapping paper. And that’s just what it is, next year the girls won’t be this small and our photo will be in a different location (maybe even different state). 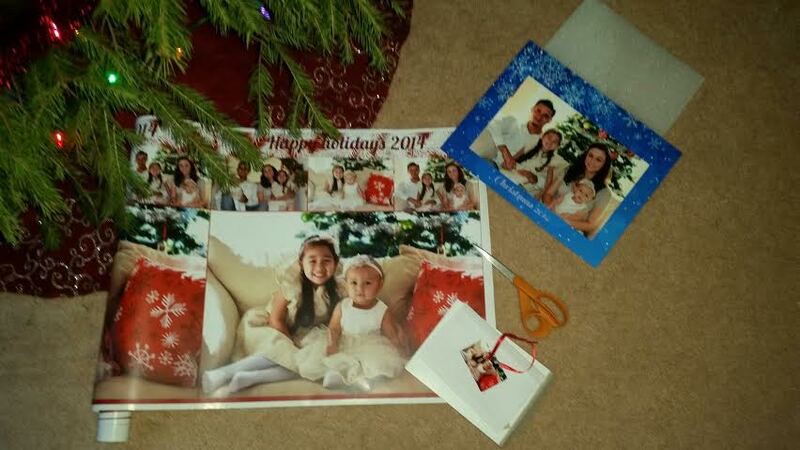 I was shocked at how amazing.. How perfect our ornament, wrapping paper and aluminum print came out. 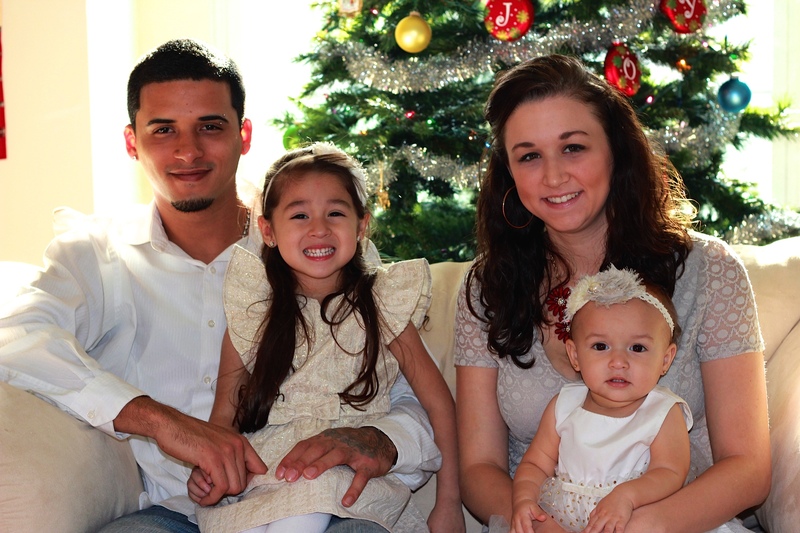 Taken back for a moment thinking we look like were the perfect family, no problems just happiness. Collage.com captured that perfectly with their special touches of adding text to wrapping paper (Happy Holidays 2014) and the text on the ornament. The perfect size, rounded corners and special touch of date and greeting. Its our first Christmas that we’re away from mothers, fathers, in-laws, cousins, brothers and sisters… Though I cannot explain the happiness to have a Christmas with my father again, to see my sisters faces light up on Christmas morning with my girls also; but also helping Heather bake cookies and wrap gifts. It’s a bitter-sweet Christmas… Though these special touches make those who are a far (Nana, Abuelo and Granny) feel like we’re still around and to know we didn’t forget about them. 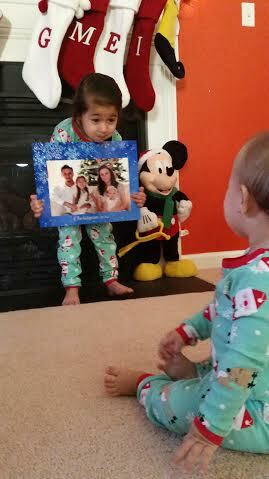 Isabella showing off our family aluminum photo to her sister. We get to send our girls smiles while keeping our perfect family photo for ourselves; I cannot wait to keep this a family tradition of the girls photos on grandparents wrapping paper. I’m beyond overjoyed with this experience, the overall website that Collage.com offers and their prices not extremely high for the merchandise I’m looking at for. 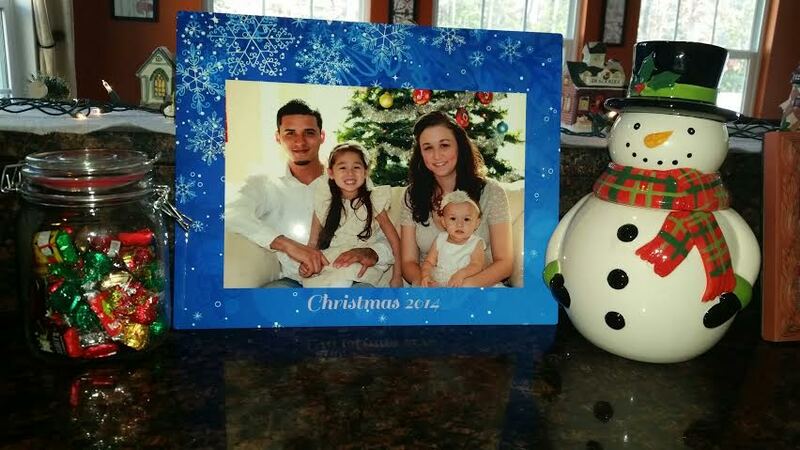 Our wonderful aluminum family photo; 11*14.
or wrapping paper as gifts for family near and far? I have three giveaways for these amazing products. 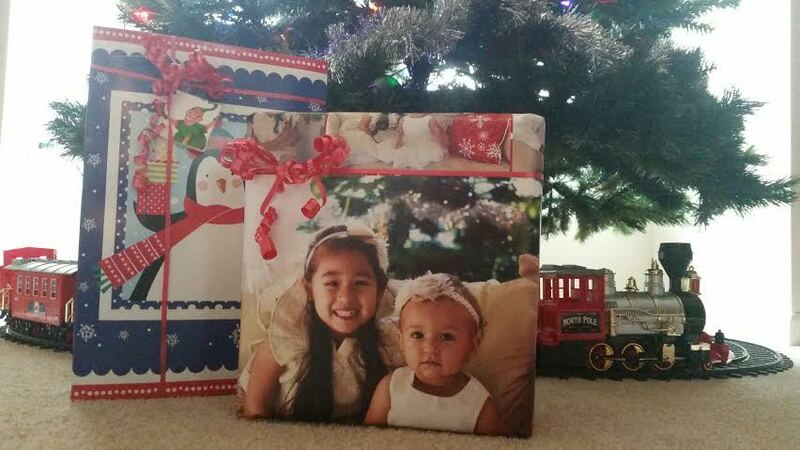 Third: A special touch with a 6ft roll of wrapping paper (Add your special photos and text). 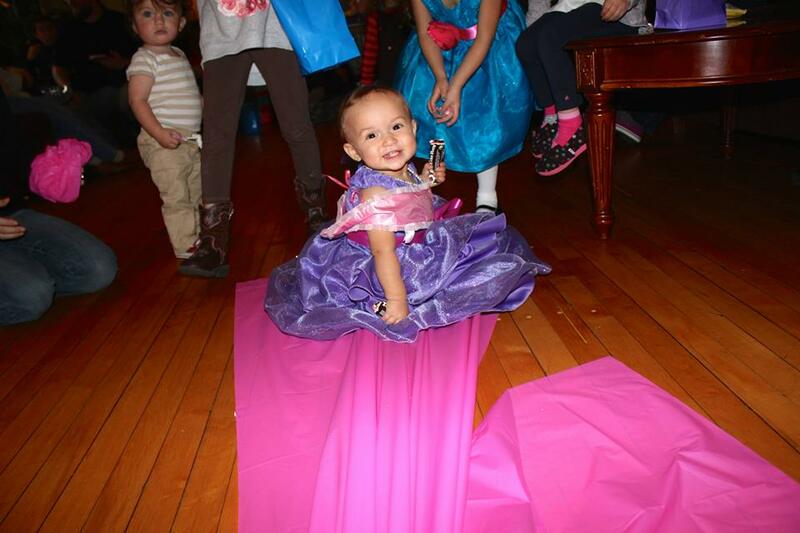 and a Princess dress to top the bash off! It’s still crazy to think that Elleanna is one, I’m seeing her facial features changing and watching her become so independent. Before leaving Maryland a couple of weeks ahead of time I was serving this amazing table of four women having drinks and food. Laughing and talking about mom moments I found myself telling them all about Elleanna’s birthday and how I’m a blogger looking for someone who may be able to help create dresses for the girls to wear to the birthday party. 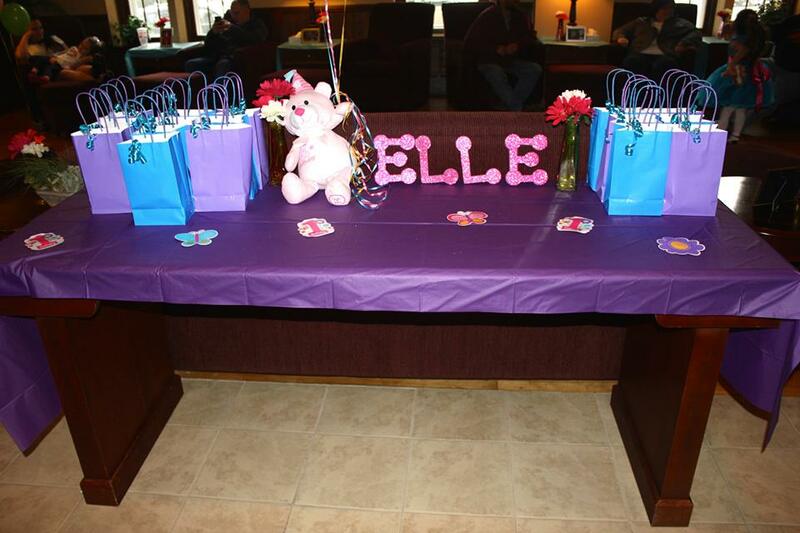 Little did I know how this table would change not only my stress level but also adding an outstanding touch to Elleanna’s birthday. Courtney began showing me pictures of adult dresses she designed and told me to contact her and she would help Geraldo and I out. 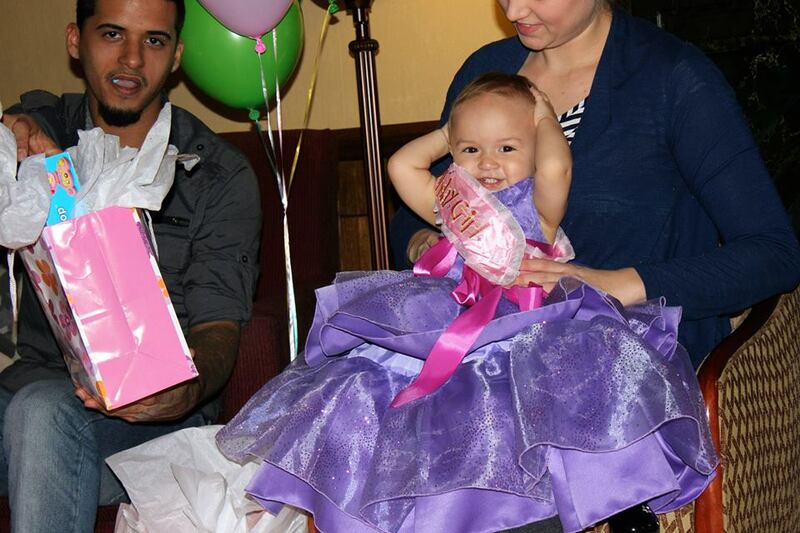 I didn’t know if she could do one or both dresses for Isabella and Elleanna. I didn’t know how they would turn out and I didn’t know if they would be everyday wear or that Princess fairy tale. With the days following Courtney and I began to email, talking about patterns and colors I found myself excited for the creation the Courtney would be doing. Lace, bright and Princess like the gowns added that perfect touch to the party. If you are ever in need of that elegant dress for a holiday, birthday or special evening out I recommend Corse’Couture and Courtney’s outstanding stitching and eye for fashion. 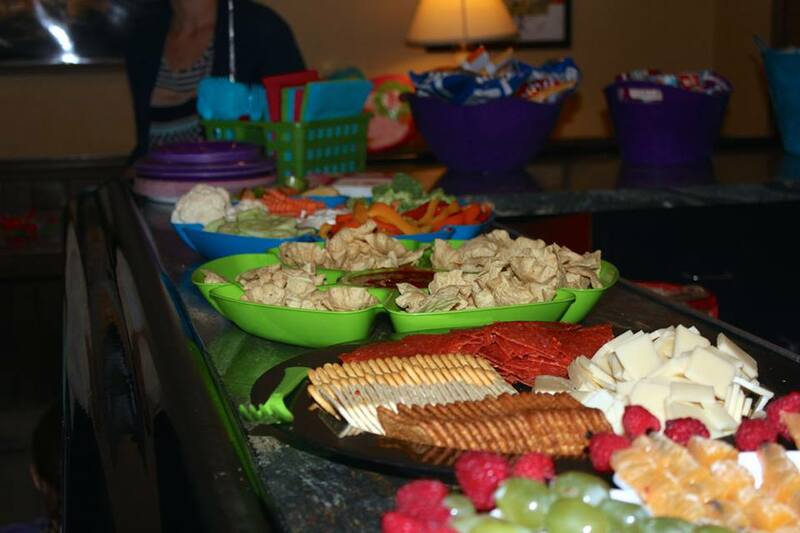 From caterpillars and snails to chips and dip we had snacks lined up on The Beacon Hotels bar. 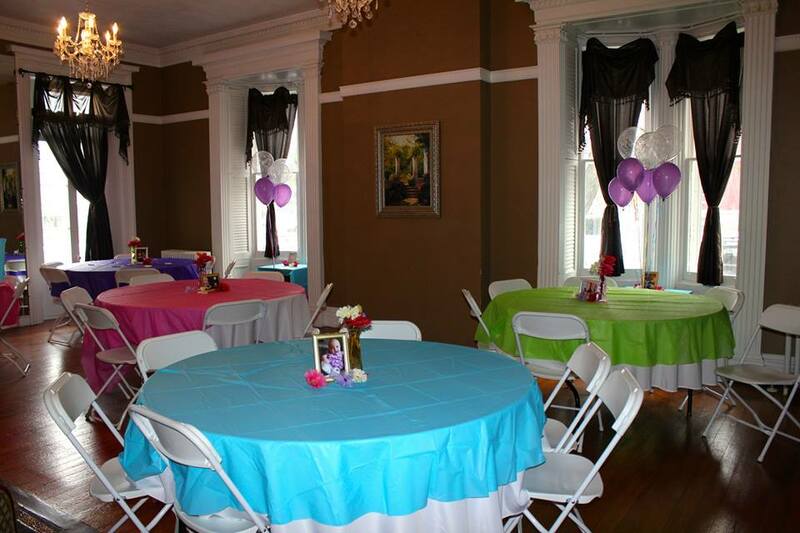 With plenty of room to sit and eat; the many tables in the conference room set up for cake I wondered who would show in our long list of invites with the weather being snowy. 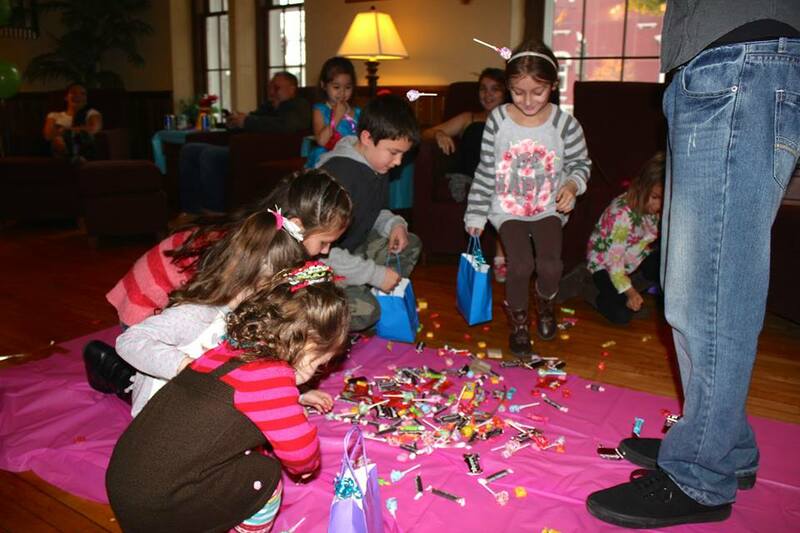 Pictures laid out on cake tables and side tables showing Elleanna’s transformation, banners hung (though in a rush missing an N…) balloons scattered and goodie bags filled the bash was great; though not perfect missing many family and friends from Abuelos and Grannies, ti-ti’s and tio’s along with cousins our hearts ached for the party would go on. We cannot wait to celebrate with those far away soon though with the many holidays to cherish with the children, the birthdays to set off with a bang. 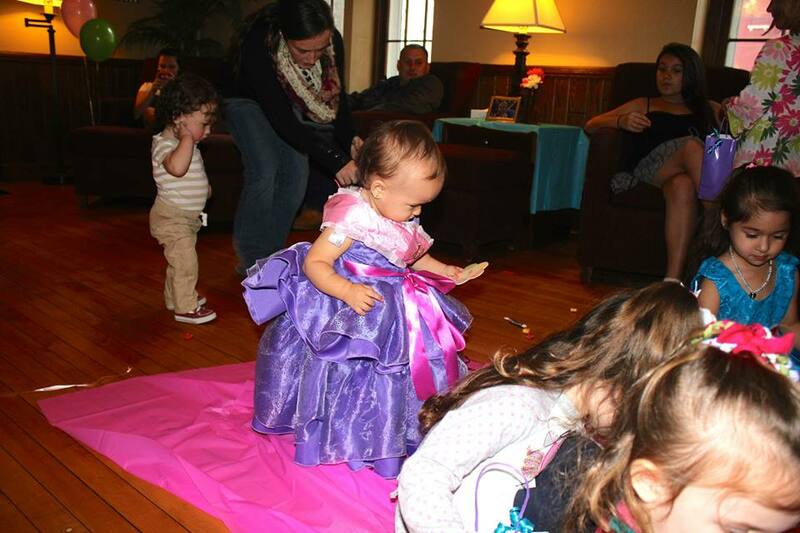 I was pleased to see Uncles and Aunts, cousins and little ones show with my best friend and Princess and the ever so touching moment that my family of four blew out Elleanna’s birthday cake (though mainly Isabella blew it out and we fought Elleanna over a lollipop to smash the cake). 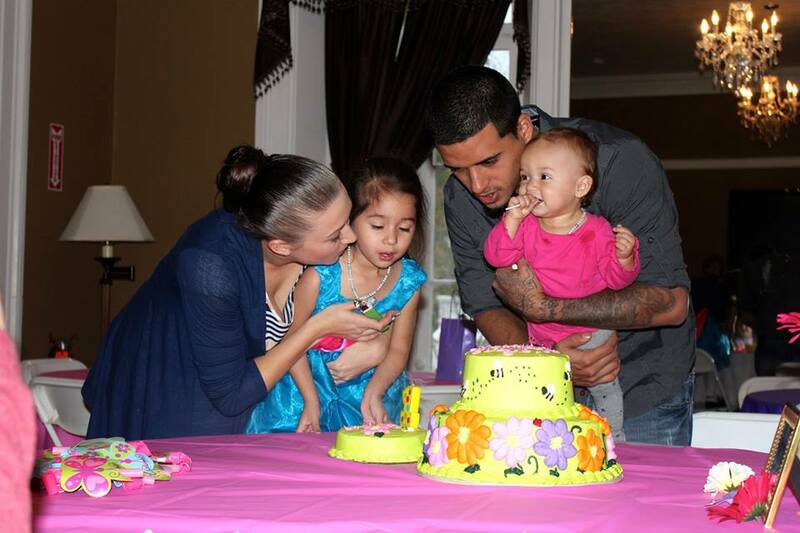 Getting ready to blow the candle out as a family, Isabella beat us to it though. 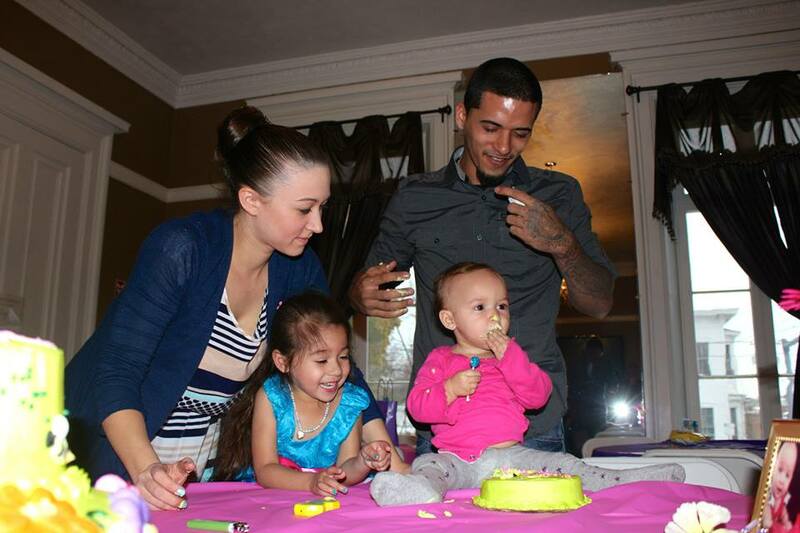 Daddy got Elleanna with her birthday cake smash. She just wont give up that lollipop. I cannot thank everyone who helped set up, coordinate and participate along with showing up to The Beacon Hotel in Oswego New York. 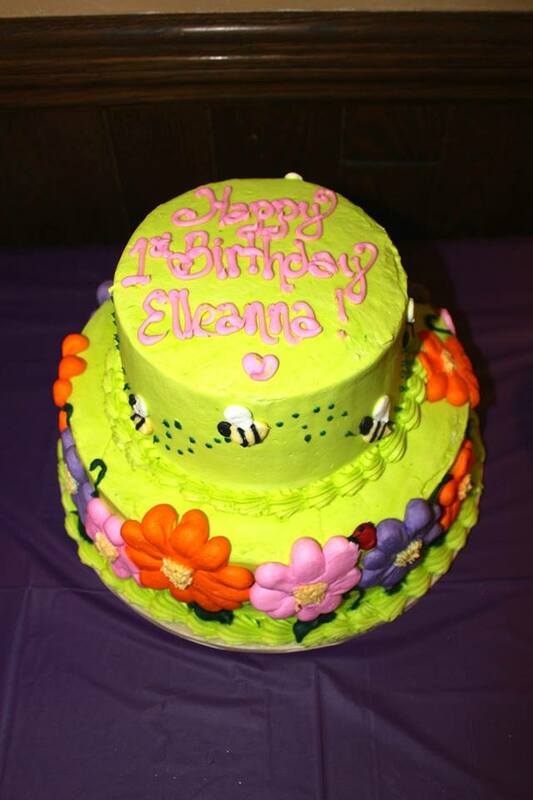 You all helped create an amazing venue, food and surround Elleanna with love near and far. 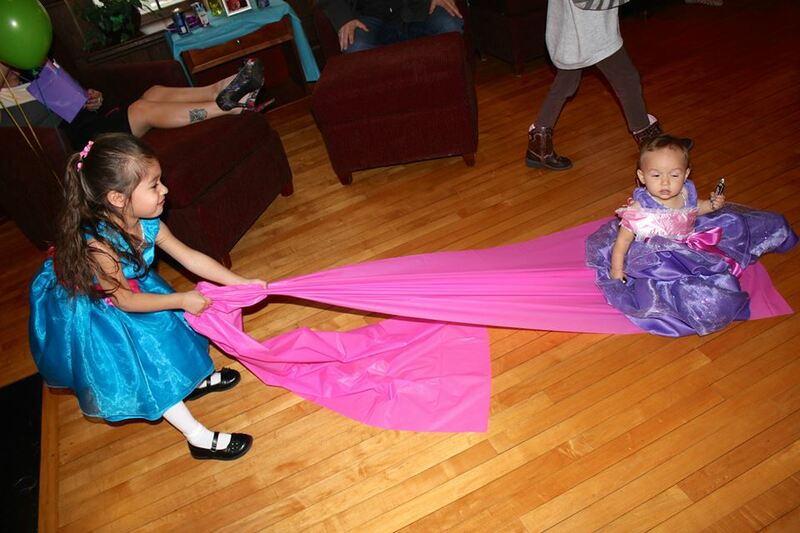 From the special touch with their Princess dresses to the confetti balloons made by daddy; the snails and caterpillars made by Amber, Joyce, Emily and myself; the photos and flowers set up by Krista, Mike @thisdadsview and breathtaking photos by Heather @SugarnSpicelife. My handy helper Renee and Vanessa for changing the girls into their dresses and beautiful necklaces by Courtney. I know many have helped with many aspects of this birthday and I cannot thank you enough.